The Soft Coated Wheaten Terrier gets its name from its profuse wheaten coloured coat. Historically this name was used to distinguish it from its two Irish relatives the blue-grey Kerry Blue Terrier and the wirey, red coated Irish Terrier. It needs to be remembered however that since the Soft Coated Wheaten terrier was bred as a working terrier that conformation of the dog is of paramount importance. Any dog should be capable of performing the function for which it was bred. Whilst this terrier gets its name from the coat, the coat should be regarded as the icing on the cake. A Soft Coated Wheaten Terrier with an attractive coat should be severely penalised if it is not physically sound. There are however a number of features of the Soft Coated Wheaten Terrier Coat that need to be kept in mind. The coat of the Soft Coated Wheaten terrier is a continuous growing coat. Given that, it does not shed and if well kept does not smell. Due to these factors it has been found that people who are allergic to other breeds of dogs are not allergic to the Soft Coated Wheaten terrier. In the United States the Wheaten is referred to as the asthma sufferer’s dog. Texture and volume of the coat varies. The coat of the traditional Irish Soft Coated Wheaten terrier is soft, silky and wavy with a lustrous shine. This made it an easy coat to care for. With the development of the breed in England, Europe and the United States the coat has shown changes with a thicker coat being more evident. Whilst many of the dogs in these countries might have a voluminous flowing coat the texture is not as silky and as lustrous as the Irish style of coat. 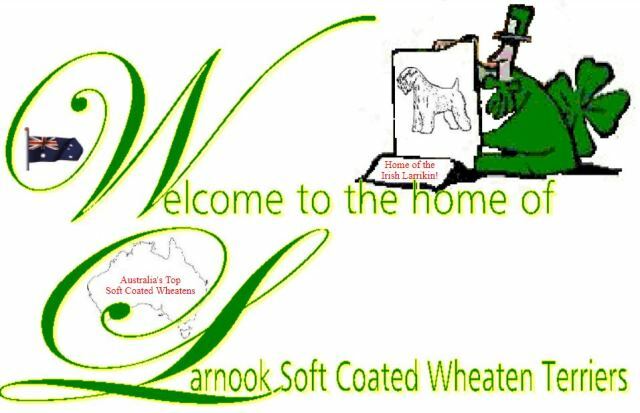 In Australia with the blend of Irish, American and European lines the texture of the coat can vary considerably between Wheatens’ in the one litter. It is not uncommon to see Wheatens’ with predominately American bloodlines with the lustrous silky Irish style coat. The various styles of flowing coats in Wheatens’ are neither good not bad, just different. A thick wooly coat is however of concern. Colour also varies from one Soft Coated Wheaten to another. Shades vary from pale to rich honey, and to reddish wheaten. There may be black tipping around the mouth and ears. A white coat is not acceptable. It is important to be aware that the coat of a Soft Coated Wheaten terrier is slow to mature in both texture and colour. Surprisingly Wheatens’ are very dark, being almost black, at birth. As the hair grows, the colour changes along the shaft of hair to the recognisable Wheaten. It is usual to see baby Wheaten pups with black tipping. As the coat matures the shades of wheaten can vary. It is common for a Soft Coated Wheaten terrier to be very pale, almost white, in colour at about 12 months of age. As they mature the wheaten colour develops. Texture also changes with age. Pups can be fluffy and wooly. In some Wheatens’ the thick fluffy coat persists until about three years of age by which time the coat changes to a flowing, wavy coat. The changes in coat colour and texture in the juvenile Wheaten can first be seen at the back of the neck and then spreads over the rest of the body. 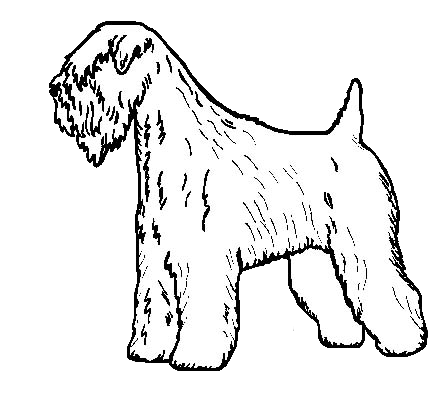 An immature Soft Coated Wheaten terrier, by that I mean a Wheaten under about 3 years, should not be penalised in the ring if the coat is not wheaten coloured and if it is not flowing. The ear fringes are removed and the hair is cut close to the skull and cheeks. The fall or top-knot which is the long hair from the forehead over the eyes, is maintained at full length, down to and in many cases over, the nose. The whiskers, beard, and leg feathering are left as profuse as possible. The hair is cut close at the neck and chest and graded into the shoulders. The long body coat is neatly topped to follow the outline of the dog. With this approach to trimming the Soft Coated Wheaten looks like a terrier. It was a style of trimming that was functional in a working terrier. For some time a similar approach to trimming was not followed by those showing in Great Britain where the Wheaten was not initially shown in the terrier group. The result was that the trimming of a Soft Coated Wheaten terrier in Great Britain meant that they did not look like terriers but more like a Bearded Collie. I was pleased to see on a recent trip to Great Britain that, now that the Soft Coated Wheaten terrier there is included in the terrier group, they are being trimmed as terriers and more in keeping with the guidelines recommended by the Irish Kennel Club. The approach to trimming recommended by the Irish kennel club is also more practical in maintaining the coat of a pet Wheaten and lends itself to making the Soft Coated Wheaten terrier glamorous for showing, in what after all is a beauty contest.